Now are you wondering about that extra rim to rim I mentioned earlier? 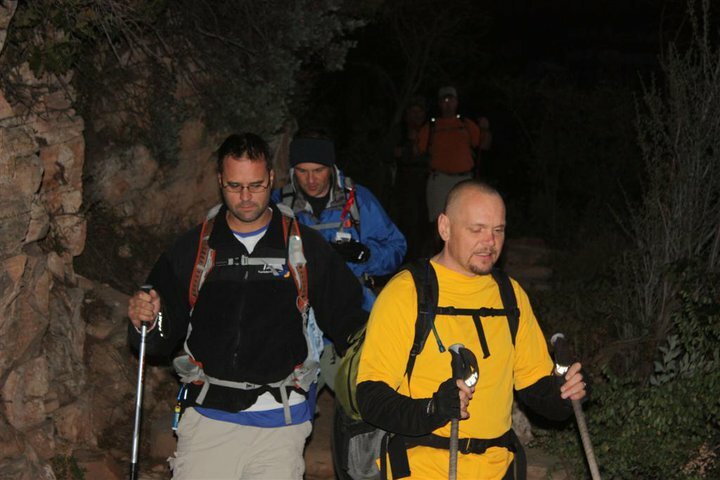 Well my team is in training for an eight hundred mile hike in April of 2011. The hike will run from the Mexico border to the Utah border on The Arizona Trail. We felt that hiking that extra twenty-four miles would give us a good idea of what to expect from our upcoming forty day trek across Arizona. We were not disappointed. Greg said “Let’s play a game to help pass the time,” “I know, let’s each name a sport, but it must make money.” So we spent the next hour thinking of and chiming off different professional sports. This helped until we eventually ran out of ideas. The last thirty minutes were grueling, but we made it out at 8:20pm with sore feet and legs.